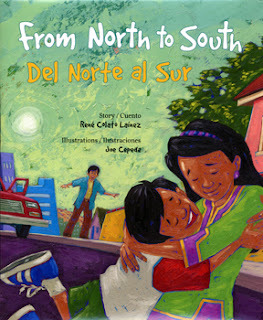 Bienvenidos/Welcome to the blog tour for, From North to South/Del Norte al Sur - a new bilingual picture book written by Rene Colato Lainez, illustrated by Joe Cepeda and published by Children's Book Press. From North to South is the story of a little boy who misses his Mama after she is sent back to Mexico for not having the proper papers. For day 2 of the tour, I'm pleased to feature an interview with the executive editor of Children's Book Press - Dana Goldberg - about the important message behind this book, the special niche of the non-profit press, and the challenges and rewards of her role as executive editor. Comment here, or at any of the blogs on the tour, (see schedule below) and you'll be entered in a draw for a copy of the book. Three lucky winners will be announced at Children's Book Press blog on the last day of the tour. From North to South addresses the issue of immigration in a sensitive way. The story reaches out to children, who so often feel the impact of events beyond their control. Was this a delicate issue for Children's Book Press to take on? If so, can you discuss? D.G. It wasn't a delicate issue for us, no. Immigration is a topic we've covered in other books in our catalog. Even though people have very impassioned opinions on what we should do about immigration on a national level, it's a reality that families are dealing with this exact issue and so we as a publisher wanted to reflect that experience for children who are going through it. In the story, there's an underlying theme of planting seeds and waiting for the flowers to grow. I thought this was a light-hearted way to convey the concepts of time, patience, and a child's hope for reunification with his mother. CBP publishes only a select few books each year. What about this story resonated with you? Why did you feel it was an important one to tell? D.G. It was an important story to tell because in all of the very emotional debate about immigration, we rarely hear the perspective of the children whose lives are upended because of their parents' immigration status. This was an opportunity for us to present that perspective to a wide audience in a way that is accessible to everyone. The story resonated with all of us because René did such a wonderful job portraying the situation with tenderness, hope, and sadness - it felt very real but very gentle. And the book takes a neutral approach - presenting the reality of how children are affected by the current state of our immigration laws without telling people what they should think. I like the CBP motto: "Many voices, one world," which encapsulates your mission. Can you explain how this translates into the books you publish? How would you define the niche of CBP? D.G. Our books reflect the fact that we share a common humanity, but also that our cultural heritage, home languages, and socioeconomic backgrounds affect how we experience the world. Simply put, our niche would be multicultural and bilingual books, but perhaps a more fleshed out way of saying that would be this: we publish children's books that reflect and illuminate the experience of communities of color in the United States. As a non-profit independent press with a primary market of schools and libraries, CBP does not share the same mandate as commercial publishers. How does this free you? How does it limit you? D.G. It allows us to take certain risks that we might not take if we were a for-profit publisher. For example, I don't know that another publisher would have published "From North to South" in our current political climate. Also, while schools and libraries make up the bulk of our business, we do sell our books to the trade (the general public) — the breakdown is probably about 70 percent to schools and libraries and 30 percent to the trade. The only way it limits us, really, is in terms of the resources we have. We're like any other cash-strapped nonprofit. We'd love to increase our output every year, but we have to watch every penny. With library and school budgets being slashed, how has this affected what CBP does? How are you adjusting for this change? Is your niche evolving as a result? D.G. See the answer to the question above! Yes, we have definitely felt the effects of school and library budgets being slashed. Also, of independent bookstores and educational wholesalers being squeezed. In terms of how we're adjusting to this (which we hope is a temporary situation), we're focusing on our Spanish/English bilingual offerings, since those represent our largest market share. We're also trying to respond to the needs we've been hearing about for bilingual board books, so we're going to start publishing those next year as well. Some of the larger publishing houses are diversifying into the territory of multicultural and bilingual books for children. How does that affect CBP? D.G. Over the last, say, 15 years, other publishers have realized that there is a market for the kinds of books that we publish. The field has gotten more crowded - in general there are just way too many books published each year for any librarian, teacher, parent, or journalist to realistically read them all - and that means that we have to work harder to make sure our books rise above the noise to get noticed. We do this by paying extra attention and care to each book; each book has to have a very strong reason to exist. In some ways it was easier when we were one of the only publishers doing these kinds of books, but then again, now there's more of a general consciousness about multicultural and bilingual books out there in the general population. Please explain the concept, first voice. Why is it important to CBP? D.G. First voice means that whenever possible, authors and artists of color are speaking for themselves about their experiences in our books. This is important to us because the numbers are so skewed in children's publishing - according to the Cooperative Center for Children's Books at the University of Wisconsin, around 10 percent of children's books published in 2009 were about people of color. An even smaller percentage of those books were written by authors of color. So publishing first voice books is our way of trying to reduce that inequity. Where do you get most of your new material? D.G. Sometimes we approach different authors we like, other times agents submit things on behalf of their clients, and we also accept unsolicited submissions (guidelines can be found on our website). Artists constantly send us postcards and photocopied samples of their work, which is a great way to find new talent. What keeps you engaged in your role as editor? What surprises/enthralls you about your work? D.G. Every book is different, and engages my mind (and my people skills) in different ways. Our authors and artists constantly surprise me with the depth of their commitment, creativity, and sense of humor. Publishing children's books is often about creative problem solving, and it's both gratifying and humbling to be a part of that process. This is the 35th anniversary of CBP. Can you tell us a little bit about the significance of this milestone, and any special plans for the anniversary. D.G. Thirty-five years is a significant milestone for any nonprofit organization, and as a small nonprofit press that’s built a big reputation for itself over three and a half decades, we’re especially proud of reaching this anniversary. We’re holding a free family-oriented event at the main branch of the San Francisco Public Library featuring music, readings, and a reception, as well as a fundraising event at the Yerba Buena Center in San Francisco on October 7th, at 7p.m. That ticketed event will feature performances by Velocity Circus and Non Stop Bhangra, as well as other special guests. Come! The more the merrier. We’re excited to celebrate with as many of our friends, colleagues, and young readers as possible. Thank you so much for the fascinating insights, and happy anniversary to Children's Book Press! Don't forget to comment for a chance to win a copy of the book. And, while you're here - why not become a follower? What an interesting interview. I enjoyed learning about Children's Book Press. From North to South sounds like a much needed book and I'd love to read it! :o) Gracias! Gracias, Beth. So glad you enjoyed the interview. Good luck on the draw! This was a great interview Megan. It is always nice to hear the editors talking about books. Thanks Dana for your participation in this tour. What a great interview! I didn't know much about Children's Book Press, so this was very interesting. Great interview! I didn't know anything about Children's Book Press or the book - what a relevant and important topic for children. Thanks for the insightful and interesting interview, Megan. It's very nice to hear the publisher's point of view on this book. Thanks so much for sharing. Megan, what good questions! and Ms. Goldberg's answers have given us a window into the world of a small non-profit publishing house. I've enjoyed learning more about Children's Book Press and bilingual picture books. Thanks, Rene. It was a pleasure to host day 2 of your blog tour. I hope From North to South finds its way to many children. And, thank you Julie, Lynda, Joan, Hal, Pat and Diane. It's always great to get your comments. I was fascinated to learn about Children's Book Press too. Great to read insights from a publisher that has always intrigued me. Thanks for offering such a well-balanced interview, Megan. Thanks for commenting, Dolores. I appreciate your input.